Exclusive offer for new affiliates: Get 40% for the first 3 months just for signing up! Intertops have been online since 1996 and have a quality sportsbook and 2 different casinos. We have an exclusive offers for new affiliates to join! 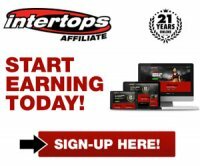 Intertops affiliate program offers affiliates a sportsbook, poker room and online casino to promote to players worldwide with languages in English and a strong focus on Germany, Austria and Switzerland. The Intertops company was started in 1983, has been online since 1996 and is licensed and regulated in Kahnawake. The casino uses Real Time Gaming software and their sportsbook is managed with their own software. The Intertops sportsbook focuses on all types of sports including betting events such as Super Bowl, NCAA football and NCAA basketball march madness. They also have consistent odds for football, rugby and motor racing. Intertops offers a one size fits all commission program regardless if you promote the casino, poker room or sportsbook. Affiliates get a tiered system starting at 20% revenue share up to a maximum of 35% for revenue above $40,000. The sub affiliate program is 5%. Intertops is nominated for the 2011 iGB Affiliate Awards for Best Affiliate Manager. English & German speaking countries. The Intertops affiliate backend offers instant statistics for the current month called Quick Stats. Here you can see impressions, clicks, registrations, new depositing accounts and total commissions. The reporting tools include traffic, earnings, banner reports, referrals, player and payment reports. Affiliates can also get an API key if you want to import your own data and incorporate into your own backend. Affiliates can get gif banners, flash, a newsletter and a few text links. The banners are available for English and German. Intertops affiliate program pays all their affiliates through a player account. From the player account affiliates can withdraw using many methods and they are dependant on your country. Payment methods include Check, US and EU Bank Wires, UseMyWallet, Moneybookers, MoneyGlobal, EcoCard, Click2Pay, Neteller and Instadebit.